...I just had to share this with y'll. I bolded my favourite bits. Hooray for sport. After 20 years of Olympic humiliation, the British have celebrated beating Australia's gold medal tally with all the restraint and good taste that you'd expect. 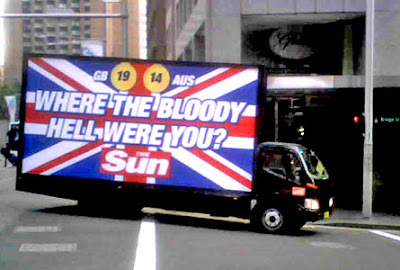 Tabloid UK newspaper The Sun hired tray-top trucks in both Sydney and London that were mounted with giant signs comparing Britain's (19) and Australia's (14) gold medal counts and driven around the respective cities. Emblazoned across a Union Jack background was the question "Where the bloody hell were you? ", referencing the Lara Bingle-led tourism ad campaign. The signs also hint at Australia's relative "failure" in cycling, rowing and other sports in which the contestants sit down — events with obvious appeal to the British and where they accumulated the bulk of their gold. The Sun even scoured London for an Australian called Bruce, finally cornering 48-year-old Bruce Howes in what they termed a "posh Kensington High Street" and confronting him with the rare defeat. "We'll get you next time," he warned. British expat Suzie O'Carroll, who forwarded a mobile phone photo of the truck driving along George St this morning to ninemsn, said she thought the Sun had been "pretty darn quick" in setting up the prank. "I've heard that the bookies are offering odds of 4/7 on Britain getting more medals next time and the same odds of us beating Australia," she said. "I'm sure the Aussies will pour everything into avoid that, but I think the GB will still come out on top." Asked if she might rub in another victory for the motherland amongst Antipodean colleagues, Ms O'Carroll said: "Well, maybe just a little bit." British excitement is understandable: it is the first time since the 1988 Seoul Olympics that the country has topped Australia's medal count. The fervour has been further increased by the prospect of federal sports minister Kate Ellis wearing red, white and blue clothing to a sporting event involving the two countries as a result of a bet with her British equivalent Gerry Sutcliffe. A spokesman for Ms Ellis said she had not yet decided when she would meet the obligation but "would be looking at the calendar in the coming months to see in which events the two nations clash". Surely, as their population is three times ours, they should have collected three times as many gold medals? Logic? What is this logic? Last week a snap election was called here in WA. You might be wondering why you care, and you probably don't, but for me in my current job, well, my feet haven't touched the ground since it was announced. This does have relevance to cricket, because I had to cancel my trip to Darwin to see Australia play Bangladesh. The match was on the same day as the election. Dedicated, am I not? It also means that posts, if any, will be few and far between. So, if not before, I will be back after the election night hangover has subsided. When I first saw a picture of a teary Michael Vaughan my first thought was that he'd realised how stupid his hair looked and was making an apology to the world. Then I realised what a foolish notion that was - as if he'd think his hair looked stupid. So I see he's resigned. How shocking. Are you shocked? You shouldn't be. Denial is not just a river in Egypt (hilarious, I know). And now that I've been able to stop laughing at the resignation and apparent surprise, I can write about how Kevin Pietersen should be England's next captain. If they want the Ashes back, he's their only hope. So, they will pick Andrew Strauss. When England won the Ashes in 2005, the good Poms went crazy for cricket. It was great to see. But the soccer mob was not happy about it. They threatened the ECB, told them if they ever won an Ashes series again they would take their firstborn grandchild (because all the ECB are old) and spin the kid into gold for Australia's one day uniforms. And then hobble the entire cricket team. The ECB did not want this to happen. They could handle losing the Ashes, but if there was no cricket team to play (because they had no feet), they couldn't even contest the Ashes, and then they would have no jobs. Bugger the grandkids. If they'd really thought it through they'd have realised that the police would have caught on if every single player was mysteriously hobbled. But they didn't think about it. So they installed Andrew Flintoff as captain. He didn't let them down. They lost five-nil. But the public (especially the public who had spent not-so-small fortunes on getting to Australia to watch the series) were not happy, and Flintoff had to go. So they thought they'd get one up on the mob, and attempted to hobble him themselves. It didn't work, but it kept him sidelined for a while. And then Vaughan returned from injury. England's favourite son, who would lead them to victory once more. Unfortunately, the selectors knew he was a liability if they were to keep their jobs and their teams' feet. So what did they do? They told Vaughan about the threat. And what did he do? He cried and ran away. Plus he was rubbish. A mediocre-at-best player whose leadership skills made up for his lack of playing ability, who made promises he couldn't keep, saw poor performances as being acceptable and couldn't justify his arrogance with results. So if you've ever wondered about dodgy selections, suspicious injuries or early retirements, now you know why. In order to fail again, Strauss is their man. Not their only man, one of ten in fact. I want KP to be the next captain because he's hot, and I for one would like to see that angsty power struggle of captains that would exist between he and Ricky Ponting/Graeme Smith/Daniel Vettori. Can you imagine Stuart Broad in such a fashion? I thought not. Also, because he's the only one who really seems to have a winning attitude (and if you hadn't noticed, this lack of winning attitude is what annoys me about England the most, and in a supreme fashion). But, and for the same reason, I don't want him to be captain. Hands off those Ashes. Flounder away. This one's for you, Vaughany. England captain's run total exceeds his IQ.